Originally published in 1996, this book presents and analyses children’s reasonings about fundamental metaphysical problems. The first part describes dialogues with children that were constructed on the basis of Descartes’ Mediations on First Philosophy and which look at children’s ideas about the relationships between true and false knowledge, mental images and physical objects, mind and body, personal existence and the external world, dreams and reality, and the existence of the Supreme Being, among others. The second part of the book draws on concepts that children of various ages have about psychological and metapsychological aspects of human reality such as: cognitive and moral development; personal freedom and responsibility; the relationships between conscious and unconscious; living and non-living; and about the fundamental drives of an individual for development and expansion of his or her needs and passions, for eternal life, and for the dreamlike world of fulfilled wishes. The book presents a systematic empirical and theoretical study of the problems, some of which were touched on in Piaget’s early writing but which he later abandoned and which were only sporadically illuminated by other authors, whereas others were completely new to research in developmental psychology at the time. It will still be a helpful guide for developmental psychologists, teachers, educationalists, social workers, lawyers, and other professionals interested in the knowledge that 4- to 14-year-old children have about the most fundamental aspects of reality and human beings. Introduction. 1. The Child as a Philosopher 2. 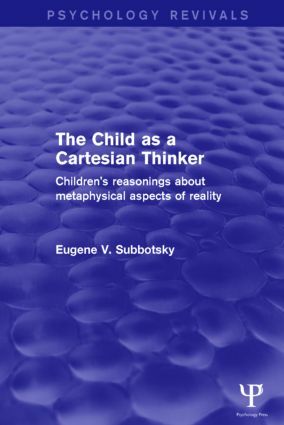 Children and Cartesian Metaphysics: An Experimental Study of Children’s Metaphysical Reasonings 3. Children’s Judgements about the Metaphysical Aspects of a Human Being 4. The Development of a Metaphysical Knowledge in Children: A General View. Bibliography. Author Index. Subject Index.